I'm loving my super Shio-koji (salt fermented rice koji)! Koji has a nice deep flavor and great health benefits at the same time. (here is one of English language descriptions about koji I found online). 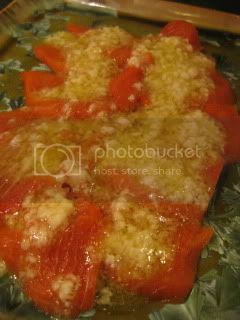 To start, I made a very simple salmon carpaccio with shio-koji sauce. I sliced a small block of sashimi-grade salmon, and drizzled sauce made with shio-koji, olive oil, lemon juice and salt. The sauce was so tasty that before I started drizzling it over the fish, I couldn't stop tasting it on its own. And, with the fish, it was like all the flavors multiplied and tasted so rich in umami. Perfect. Here's the recipe. 1. For the sauce, whisk together 2 tsps shio-koji paste, 1 tablespoon olive oil, 1 tablespoon lemon juice, and a pinch of salt. 2. Thinly-slice a small block of sashimi-grade salmon and spread in a plate. What a healthy tasty appetizer.